When you have a carpet OOPS immediately poor on club soda and blot, blot, blot, standing on paper towels to absorb. If all the staining is removed you are good. If not try this spotter. You go to rearrange your furniture or perhaps you get new. When you move it you find deep dents and indentations in the carpet. There is a super easy way to remove them. 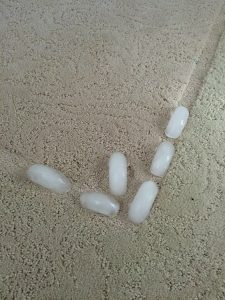 Lay ice on the carpet dents, covering them completely. Let the ice melt slowly into the carpet. Once the ice has melted, but the carpet is still damp, gently fluff the carpet fibers with the tines of a fork. Make sure the carpet is dry before sitting anything on it. I know you will think you need more, but no matter how dirty your carpet is, DO NOT put in more. More will leave residue in the carpet. 1 DROP is all you need. First fill the clean water container with 2 quarts of hot water, add the Sal Suds. Give it a little shake to mix and clean your carpet as usual. Sal Suds is heavier than water so always add it last to mix it in well. Sal Suds is created by Dr. Bronners, the people who make castile soap. This is entirely different than castile soap, but it is all natural. You can use it for all kinds of cleaning and it lasts a very long time. I got mine on Amazon.com. Put 2 cups of warm water in a spray bottle. Add to it 1/8 teaspoon of Sal Suds. Shake to combine. Lightly mist stained area. Let sit for 10 minutes and then gently work into the spot. Blot by standing on a pad of paper towels. Take a damp cloth and blot and then blot again with paper towels to remove all the liquid you can. Use very sparingly. A little goes a long way. Combine in a spray bottle. Saturate stain, let sit for about 30 minutes and then start blotting. You may need to repeat. You can use this again as long as the solution is not exposed to light which will cause the peroxide to break down and be useless. Then blot well with a pad of paper towels. Reapply if needed.